Huge sculptural roofs made from cypress wood provide shelter for this community centre and hall, completed by architect Hiroshi Sambuichi on a small Japanese island. Hiroshima-based Sambuichi made use of several traditional Japanese building techniques for the pair of buildings, which provide community facilities for a town on the island of Naoshima in the Seto Inland Sea. The most obvious features are the two big roofs, both built with a different type of structure. The largest and more unusual of the two roofs is the one that tops the community hall – a building set into a grass slope. It features a large triangular hollow beneath its apex, which allows fresh air to flow through the building. The angle of the roof also matches the incline of the grass slope. This angle is emphasised by the multi-tonal Japanese cypress – known locally as hinoki – that extends vertically across its surface. "The large roof of the hall is a traditional hipped shape that is often seen in the villages of Naoshima," said Sambuichi. "This shape is a visualization of the flow of moving materials in Naoshima, and simultaneously produces a pressure differential that causes air to circulate in the hall." The slightly smaller roof above the community centre is made up of thin strips of hinoki, which take on the appearance of louvres. At the top of this roof is a generous rectangular skylight. Four smaller buildings are arranged underneath the roof, creating a mix of sheltered indoor and outdoor spaces. 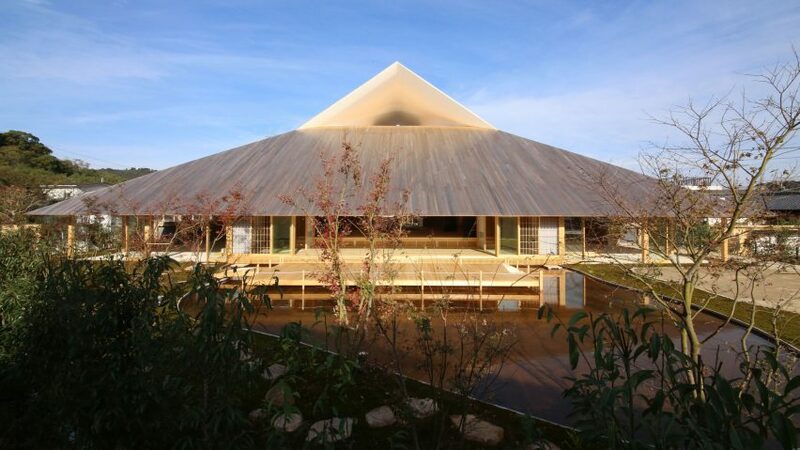 "A structure that provides protection from rain while allowing breezes to gently pass through, it inherits the principles of the Japanese traditional thatched roof," said Sambuichi. The architect aimed to use only simple materials for both buildings. In the hall, stucco gives a smooth finish to the underside of the roof, while some walls are built from adobe clay. A mix of flooring is provided. Some spaces have compacted earth floor surfaces, which were mixed with the leftover solution from a nearby salt factory, while other areas have hinoki surfaces. There are also tatami rooms, covered in typical Japanese mats, which are arranged to suit patterns of light. "Emulating the traditional layouts found in Naoshima, gardens and verandas are placed at the north and south, so that breezes will pass through the tatami rooms," said the architect. Other interesting additions include a system that draws water up from underground into pipes in the ceiling of the community centre, helping keep rooms cool in summer. There is also a stage in the hall based on the puppet-show sets used historically in the local Shikoku and Seto regions. Gardens surround the buildings, dotted with moss and maple trees, as well as a single weeping cherry tree that might "become a symbol tree of the village". A lake was created too, with an outdoor stage projecting out over its surface. Hiroshi Sambuichi founded his studio, Sambuichi Architects, after graduating from the Tokyo University of Science and moving back to his hometown of Hiroshima. He was the 2011 recipient of Architectural Institute of Japan Prize, for his Inujima Seirensho Art Museum. Photography is by Sambuichi Architects.